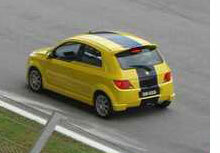 Proton showed us a sneak preview of the upcoming Proton Savvy facelift at the recent 2006 A1 Grand Prix event in Sepang. This photo is from a paultan.org visitor from Savoc.net. While the strange shoulderline is still there, the awkward rear end design that looks like the front of a Proton Waja is now gone – though the rear hatch still sinks in between the two rear lamp clusters. The Proton badge has been placed slightly upwards. Originally scheduled for public release this Friday, because of certain circumstances it looks like we’ll have to wait a little while longer than that for the new 2007 Proton Savvy facelift – just a little bit longer!